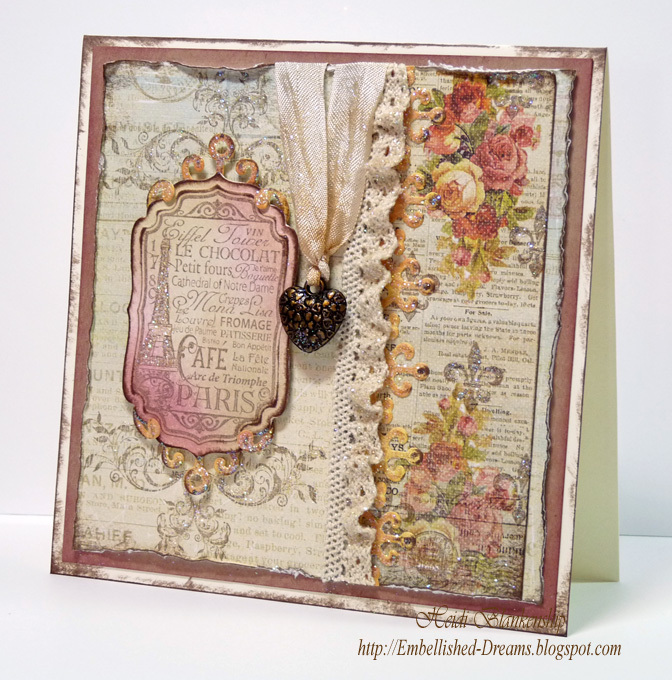 Today I have a 8 x 8 scrapbook layout to share with you. 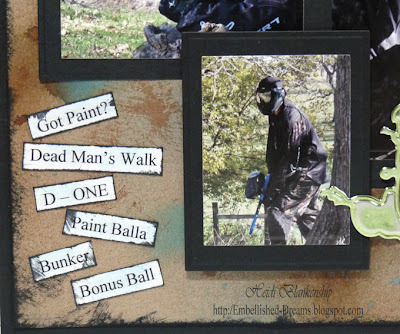 The pictures are of my oldest son who LOVES to play paintball!! The layout is more of a simple one but I wanted the pictures to be the main focus. 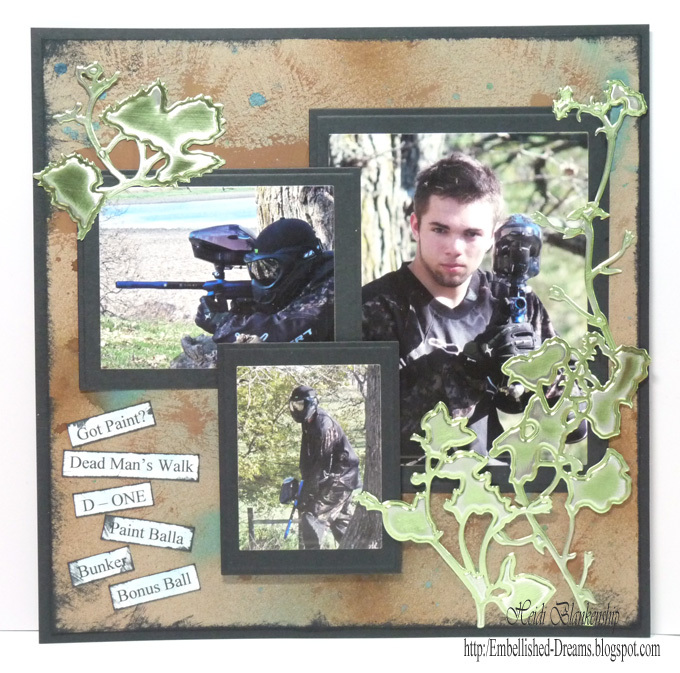 I used LF-132 Grand Rectangles and S4-132 Classic Rectangles Large to die cut the photos and create the mats for the backing. I used Spellbinders™ Premium Craft Foils Delicate Pastels (green) and S5-066 Shadow Flowers to create die cuts to accent the photos and then I lightly sanded the foil. 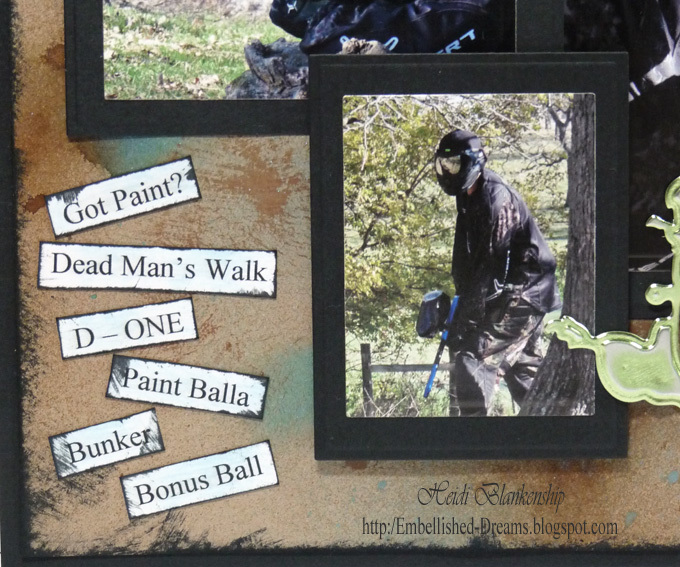 I don't know all of the paintball terminology so I had my son type up a few words and then I hand cut and inked the edges. Good morning blogging friends! Before CHA I was very excited to received an email from Joan Fricker from At Joan's Garden and she asked if I would like to be a Special Guest Designer for one of her blog challenges! Joan offers up a challenge based on my project and gives you two weeks to complete your project. Sounds pretty fun to me! To find out all of the details--how to enter, where you can post and the prize (we can't forget the prize *wink*) please check out At Joan's Garden . I have a step-by-step tutorial to share with you. 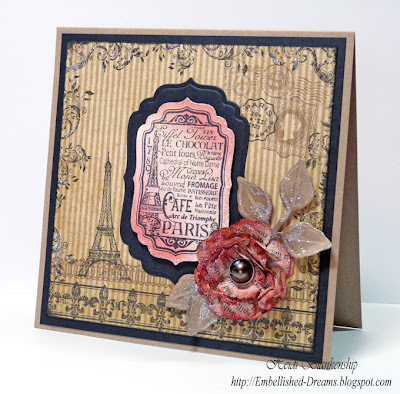 I am going to show you how stamping on pattern paper and totally change the appearance of your project. Whenever I post a card where I have stamped on the pattern paper I seem to get so many emails asking--where did you get that paper? 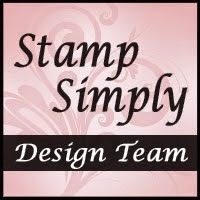 When I tell them it is pattern paper that I stamped on and gave my own little twist to it they always say--wow, I never thought about stamping on pattern paper. 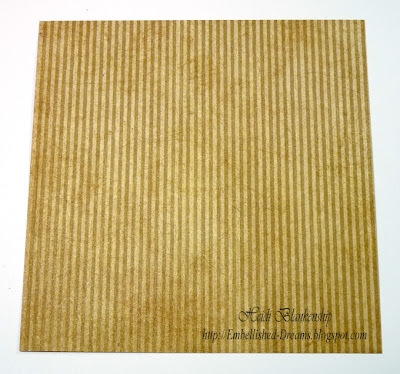 Before I get started I want to show you what the pattern paper looked like. You want to use pattern paper that isn't too busy in the background. This is Curtain Call from Graphic 45. I used two stamp sets from JustRite Stampers CL-Bon Voyage and CL-Greetings from Paris to do the background. 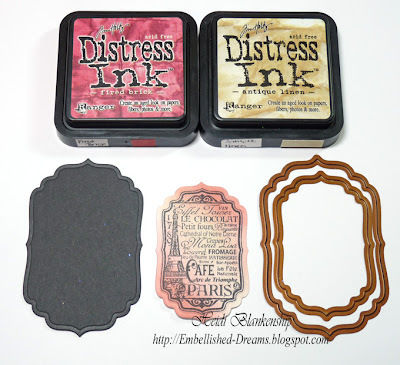 I started with Tuxedo Black ink and two stamps to make a border around the edges of my paper. 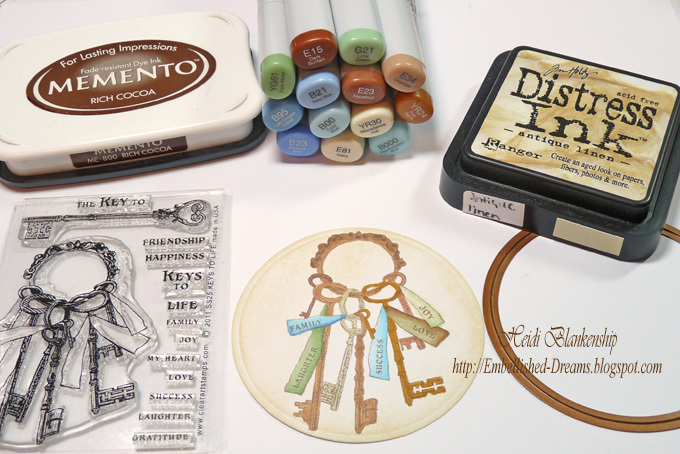 Next I added stamped images using both Tuxedo Black and Rich Cocoa ink. 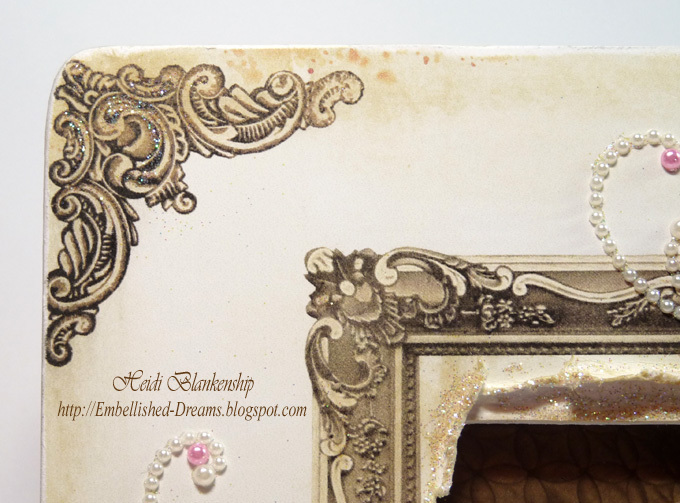 Once I had all of the stamping done I added a little glitter on the flourishes using Glue Gloss and Pralines & Cream Fairy Dust Glitter from Clearsnap. 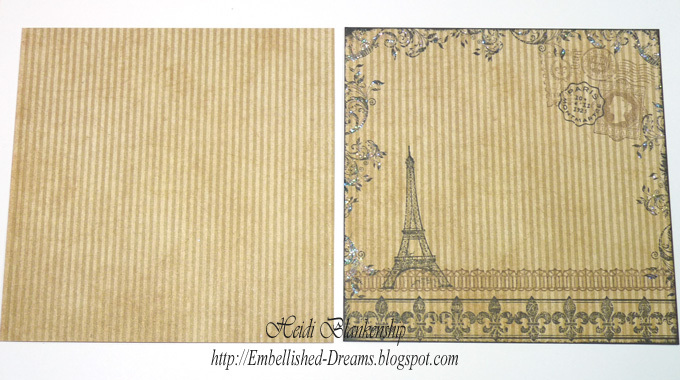 Here you can see a before and after picture and how much the stamping changes the look of the paper. 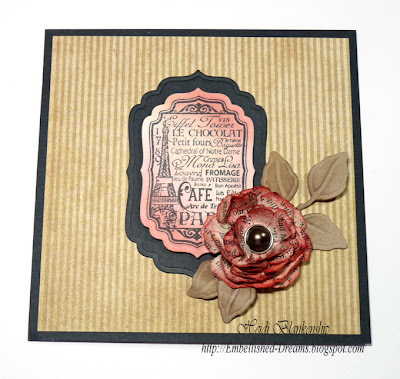 For the center image on the card I used Tuxedo Black ink to stamp the image and then I added the color using Ranger Fired Brick and Antique Linen Distress Inks to add the color. I used S4-190 Labels Four and the Grand Calibur to cut/emboss the label shape. Take a look at it now with all of the stamping. What do you think? It's a totally different look and very easy to achieve. I used old book pages, S4-328 Foliage and S5-050 Rose Creations to create to rose. I inked the edges with Fired Brick and Rich Cocoa inks and I added a little more glitter. ***Several of the supplies I used to create this card can be found At Joan's Garden. Please be sure to check out all of the details for the challenge. I want to say a special Thank You to Joan for having me as a Special Guest Designer!! I can't wait to see what you create with the challenge!! Have fun and be creative!! Good morning blogging friends! 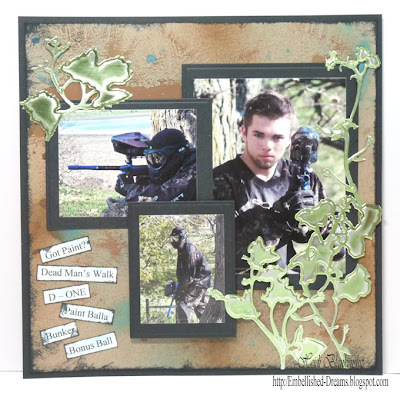 It is day two of JustRite Stampers New Release. For today's project I used the New Greetings from Paris stamp set from JustRite. Like I said yesterday I think this is my all time favorite release!! 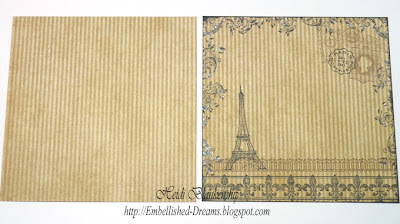 Here is the card that I designed using Greetings from Paris. 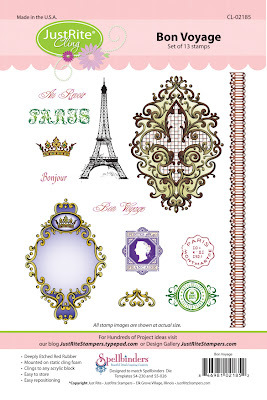 The stamp set is designed to match Spellbinders S4-190 Labels Four and JustRite JB-08950 Nested Frame Dies. 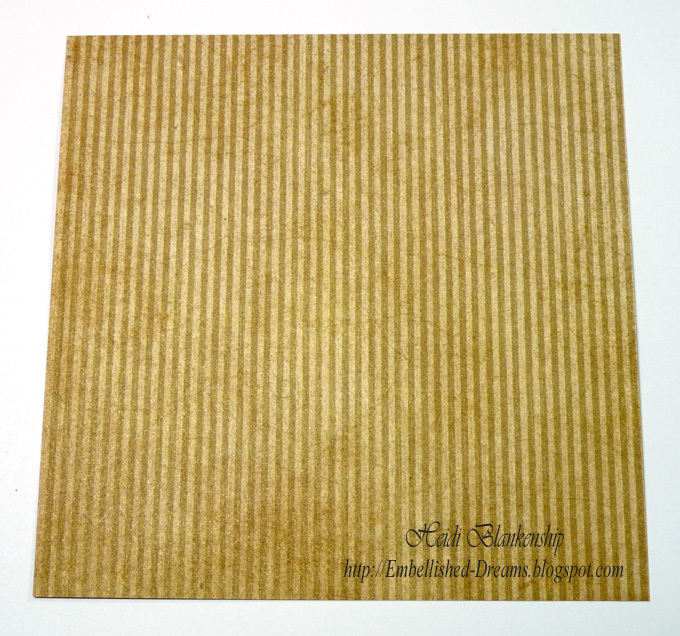 I stamped the label image on to Simply Smooth White cardstock with Rich Cocoa ink. 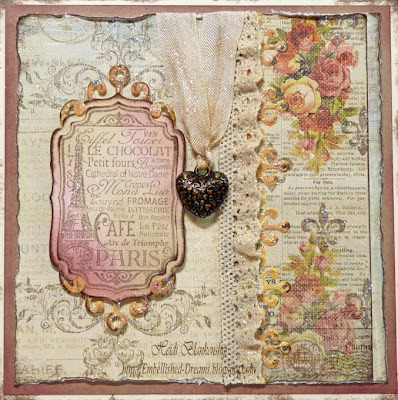 Then I added color to the image using Victorian Velvet, Antique Linen and Old Paper Distress Inks and then I used S4-190 Labels Four and the Grand Calibur from Spellbinders to cut/emboss the label shape. 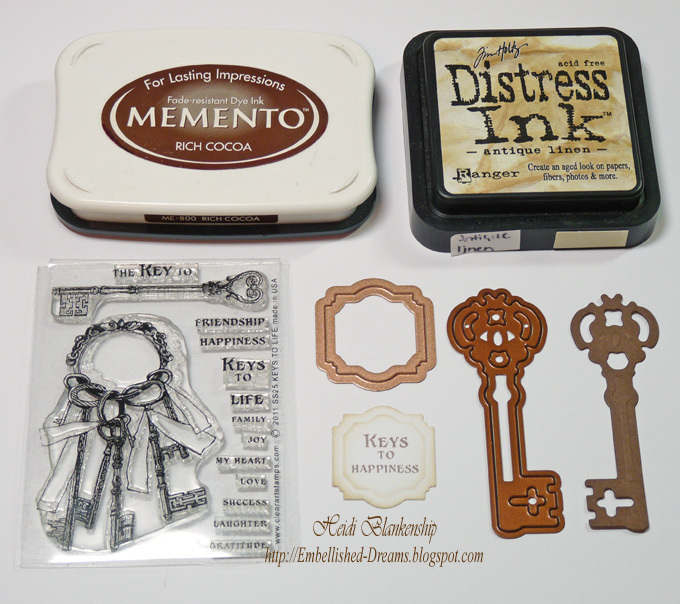 I also used one of the die templates from S5-059 Ironwork Motifs to add little accents around the label. 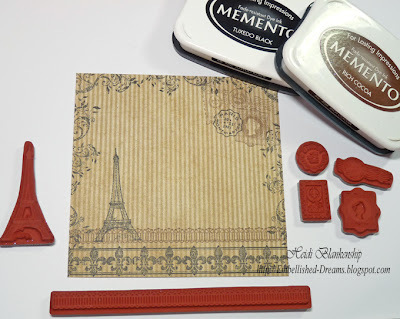 I inked the edges with Rich Cocoa and added 3D Foam Squares to add a little dimension. I stamped the flourish image on the background paper at the top and bottom with Rich Cocoa ink. I added a little heart charm with some seam binding to the side of the label. 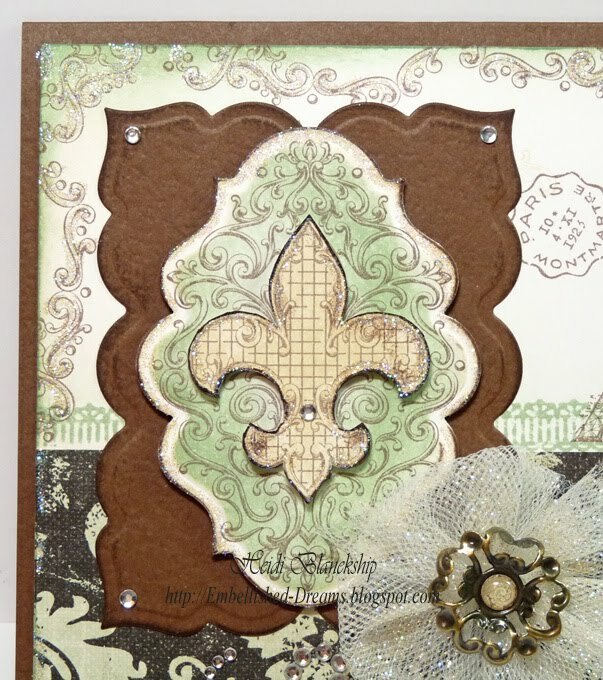 On the other side of the card I stamped the Fleur de Lis image on the floral paper and added a border using S5-058 Ironwork Accents and some lace trim. I distressed the edges of the paper and added Pralines & Cream Fairy Dust Glitter. Please be sure to visit each of the Design Team members and see the Beautiful artwork they have to share with you. Thank you so much for stopping by today! I hope you enjoy the New Release and you are inspired to create!! Good morning blogging friends! 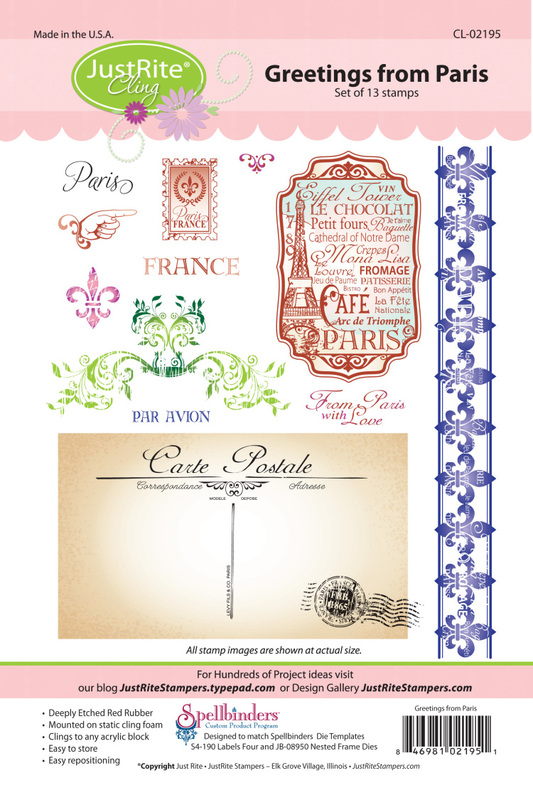 Today, is the beginning of a three day New Release with JustRite Stampers. I will only be able to do the 23rd and 24th so please be sure to visit the JustRite Blog on the 25th so you don't miss out on seeing all the beautiful projects the designer have been busy creating. 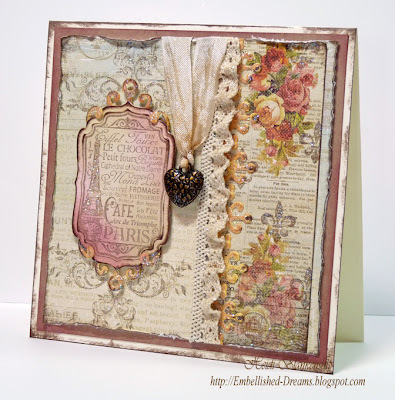 Believe me you won't want to miss a day of this release--it is filled with so much shabby goodness!! I have to say I think this is my personal all time favorite New Release!! 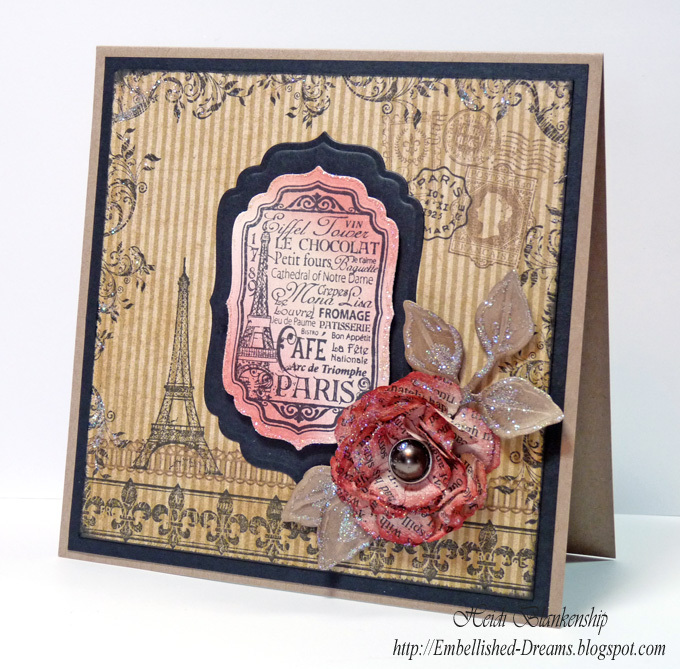 Today, we are sharing project made using the New Cling stamp set CL-02185 Bon Voyage from JustRite Stampers. 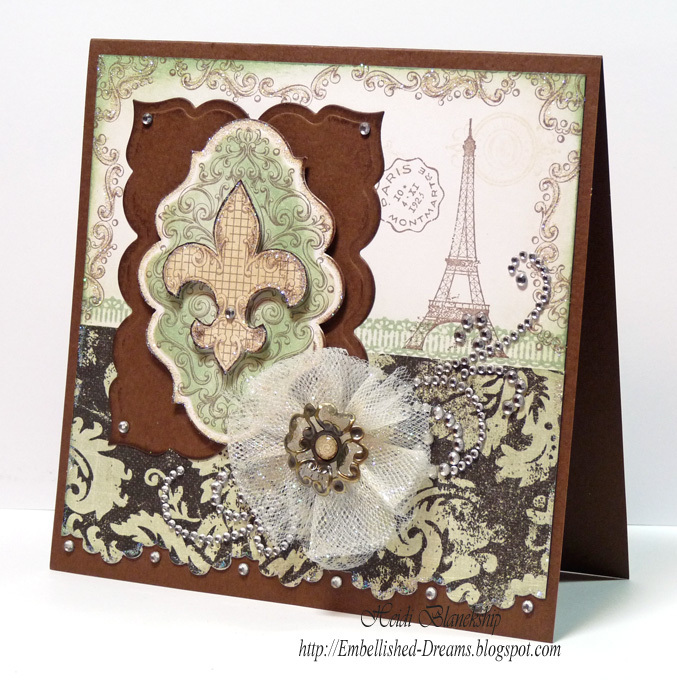 This is the card I designed using CL-02185 Bon Voyage stamp set. I stamped the Fleur de Lis image on to Simply Smooth White cardstock using Rich Cocoa Ink and then used S5-026 Labels Twenty to cut/emboss the label shape. Before removing the paper from the die template I inked through the die with Bundled Sage Distress Ink using it like a stencil. Once I removed the die cut I inked the edges with Antique Linen Distress Ink. I stamped the image a second time and used Antique Linen Distress Ink to color the Fleur de Lis and then hand cut the image and inked the edges with Rich Cocoa ink. 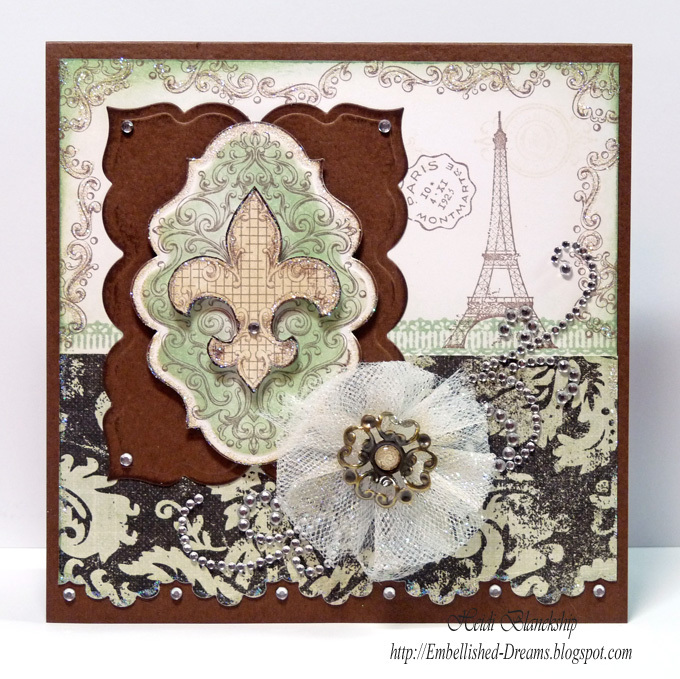 I layered the two piece using 3D Foam Squares and then add a brown label die cut using S4-347 Labels Twenty-Three. 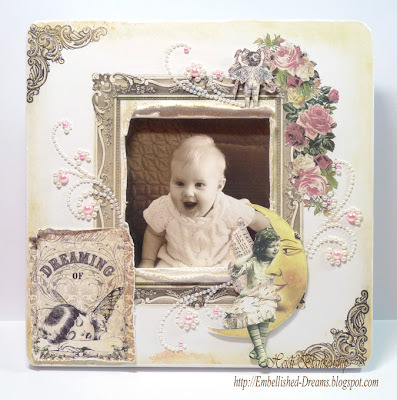 I used Bundled Sage to stamp the border right above the patterned paper and I stamped a few of the other images from the stamp set on the side to create a little collage. 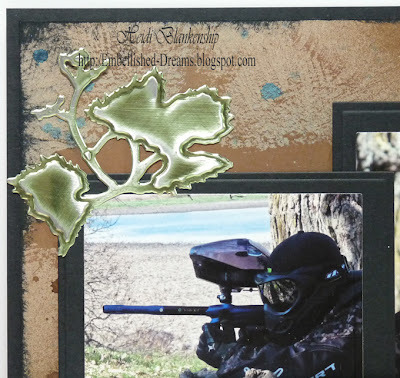 I also used one of the larger stamps in the set to create a border going around the outer edge of the card. Then I inked the white base with Antique Linen and Bundled Sage Distress Inks and edged the paper with Rich Cocoa Ink. To create the decorative edge I used E8-003 Classic Triple Scallop. I made a tulle bow and added a Trinket from Bo Bunny to the center. 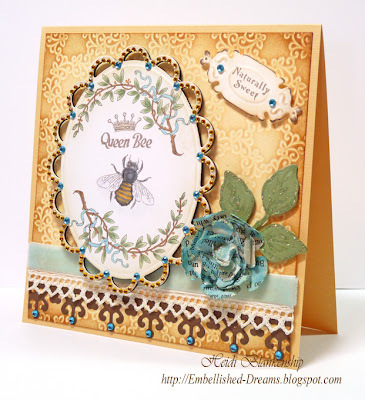 I used Prima Printery Collection for the patterned paper on the bottom half of the card. 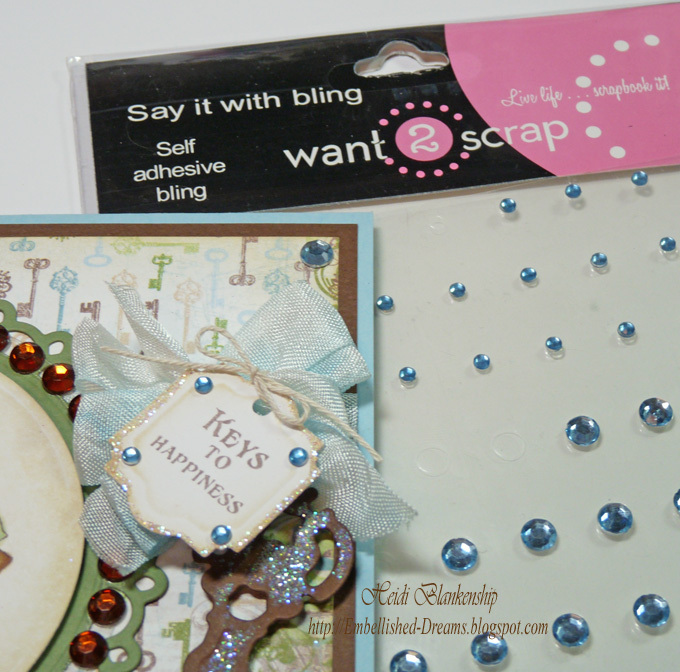 For a finishing touch on the card I added Finesse Swirls Silver Rhinestones and Baby Bling Silver Rhinestones from Want2Scrap™. 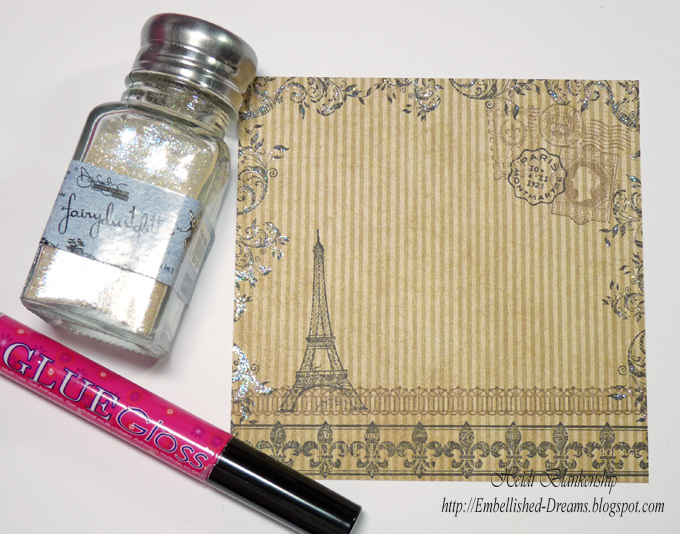 Then I added little touches of Pralines & Cream Fairy Dust Glitter from Clearsnap. I used Glue Gloss to apply the glitter and I have to say the applicator to apply the Glue Gloss is so slick--you can get the adhesive right where you want it! 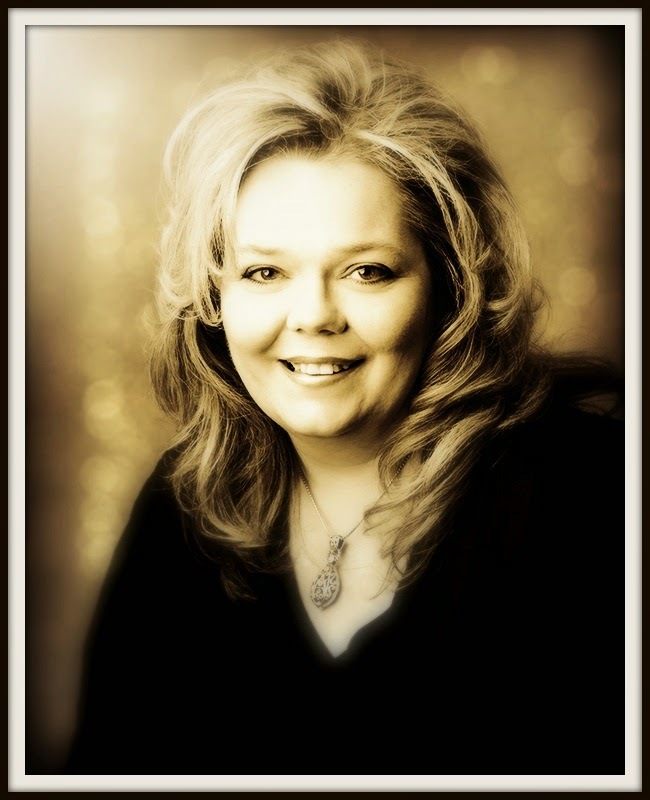 Please be sure to visit the JustRite Blog and all of the DT Members in the link list below--you are sure to be inspired!! Thank you so much for stopping by today!! I hope you have a Fabulous Day!! 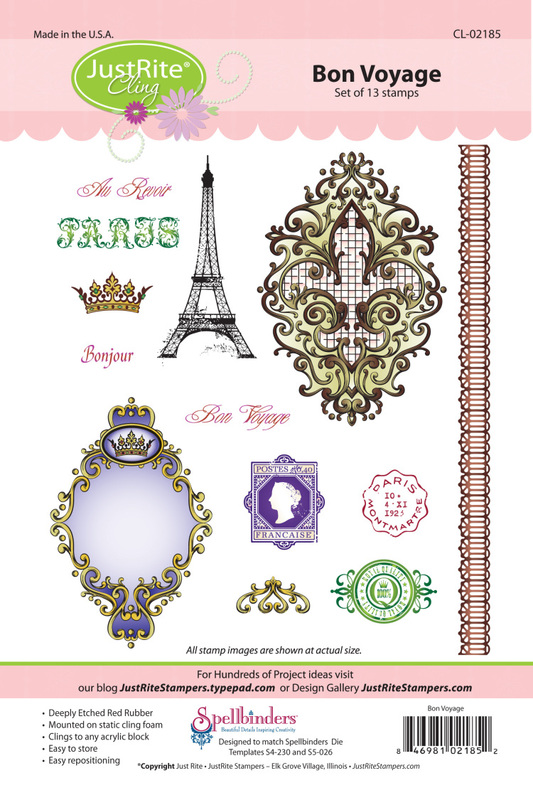 Classes at VIP Scrapbook in Rochester!! Hello Blogging Friends!! I wanted to let all of the local people know I will be back at VIP Scrapbook in Rochester, MN this weekend August 26th & 27th for their Secret Envelope Two Day Event!! 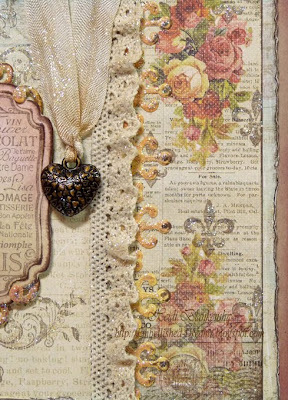 I will be teaching two classes, Creative Edge Basic and Creative Edge Advanced for the Secret Envelope Two Day Event. 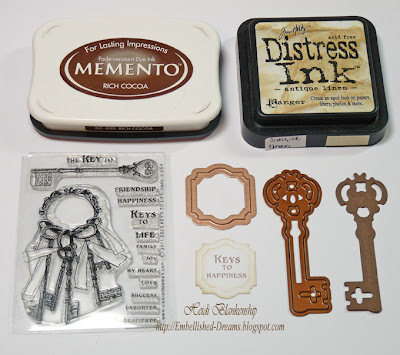 You will get to use the Grand Calibur form Spellbinders ™ and the main focus of the classes will be using the New Edgeabilities die templates from Spellbinders™ and JustRite Stampers New Cling Stamp Sets. 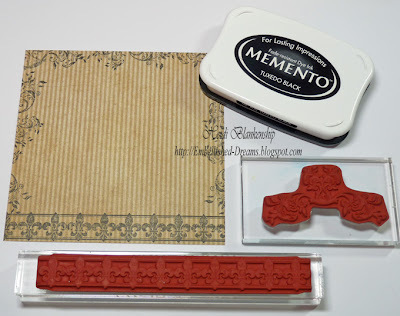 I will also be doing two make-n-takes during the event---Friday 6-7 pm Rolled Rose Creation ( to use as an embellishment on your project), Saturday 3-4 pm Hexagon Pinwheel Top Box with a sweet chocolate treat! VIP will also be having some Amazing giveaways with LOTS of Prizes involved!!! It is their BIGGEST Stash of Prizes EVER!!! Make-n-Takes will be offered all throughout the two day event. To find out all of the details and see samples of the cards please click HERE to hop on over to VIP Scrapbook!!! Good morning blogging friends! 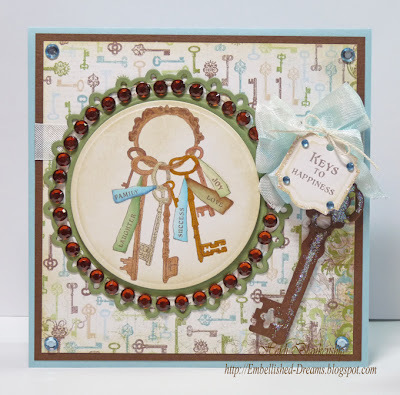 It's that time again for another Crafty Secrets Design Team Challenge. 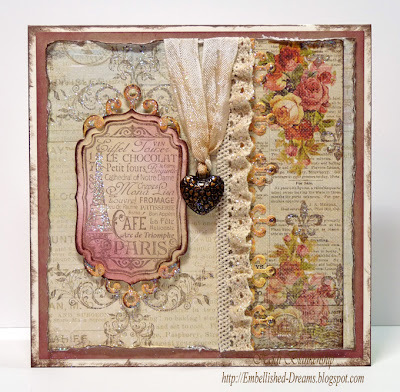 This month our challenge is to create a project with a Fairy theme. For my project I altered a frame. 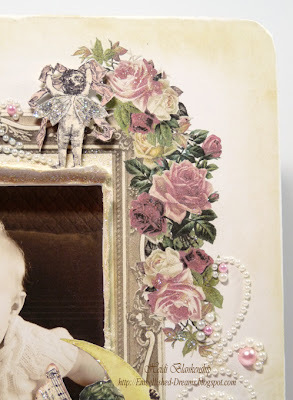 I used the one of the colored papers, a frame, corner embellishments and clusters of roses from the Creating With Vintage Patterns CD from Crafty Secrets to create the background paper. I hand cut the image of the little fairy, added Pralines & Cream Fairy Dust Glitter to the wings and used 3D Foam Squares to add some dimension. 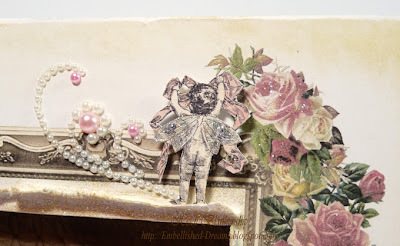 The image of the fairy is from Mini-Vintage Creative Scraps from Crafty Secrets. I cut apart the White Pearl Finesse Swirls from Want2Scrap™ and added a piece and then add some Pink Pearls at the end of the swirls. I added some glitter to the roses. 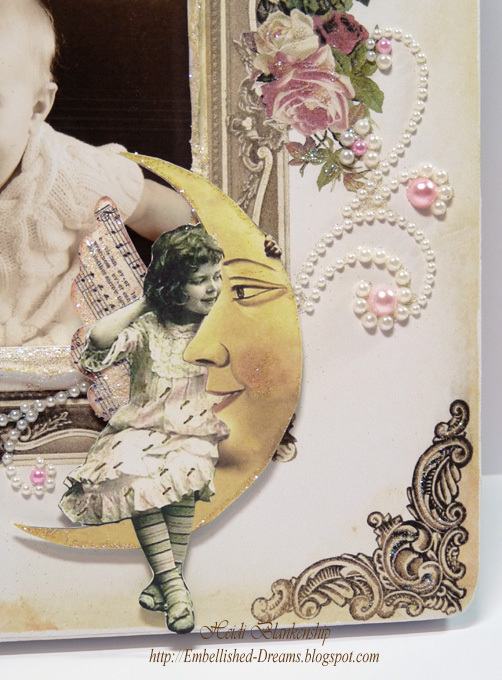 Down in the bottom corner I added a fairy sitting on the moon. 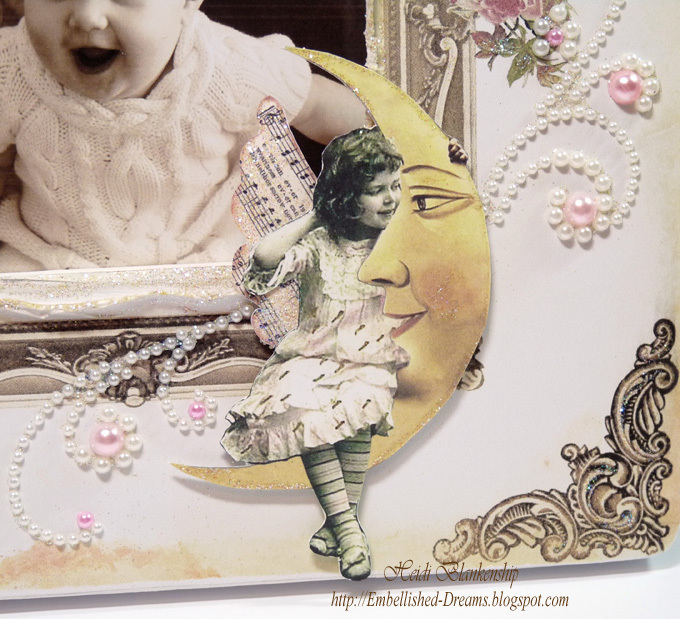 The images of the fairy and moon are from Altered Fairies Creative Scraps from Crafty Secrets. I added glitter to the wings and the moon. This sweet little fairy image is from Mini-Vintage Creative Scraps from Crafty Secrets. I distressed the edges and added glitter. 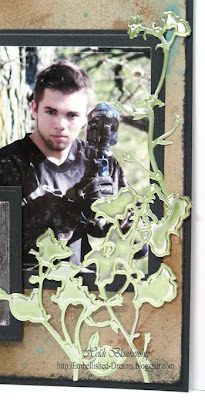 Here is a close up of the corner images and the frame. I tore and distressed the paper around the inside edges of the frame and added glitter. Please be sure to visit all of the Crafty Secrets DT Members and see what they have been busy creating to share with you. Thank you so much for stopping by today!! 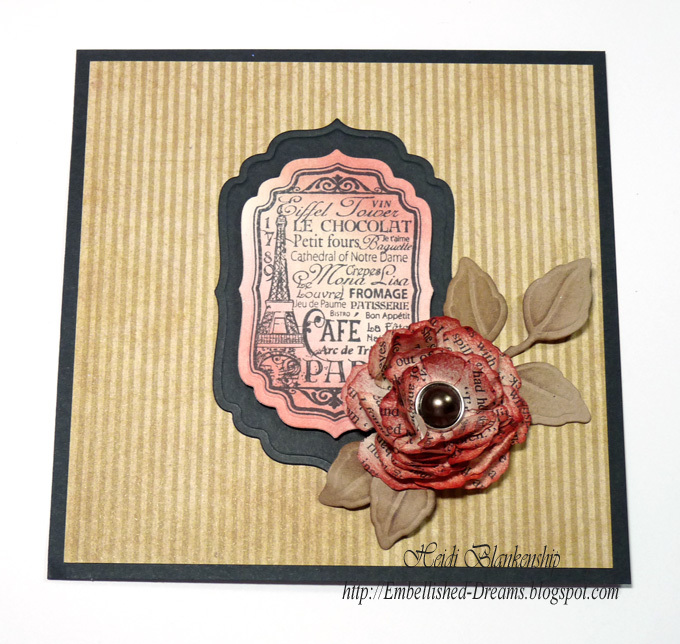 I hope you enjoy the blog hop and have a wonderfully creative day!! Good morning blogging friends! 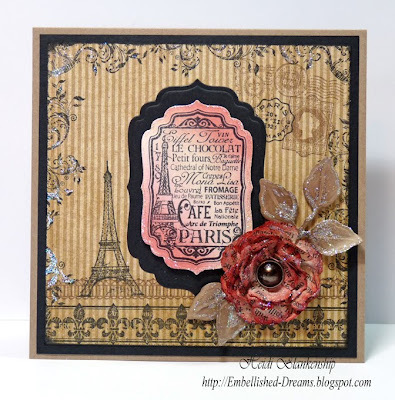 Today, I have a card to share with you and a step-by step tutorial. 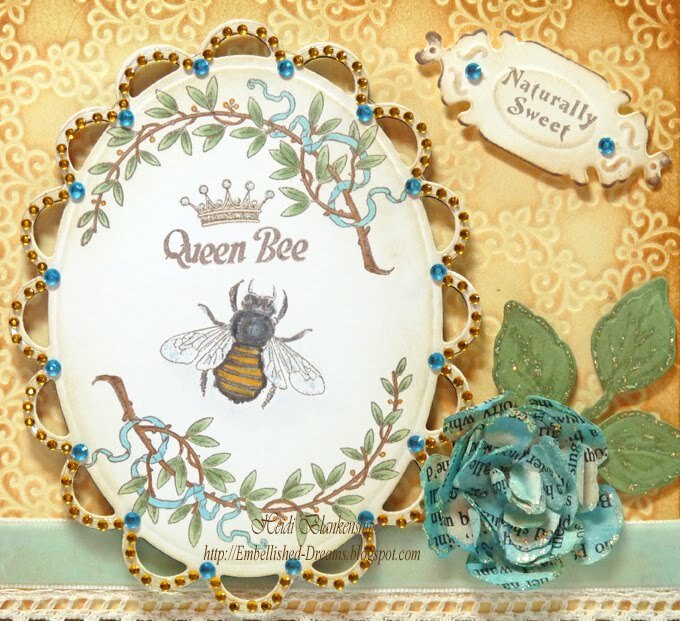 I used Nestabling™ Heart Circles Brown Rhinestones and 72 Count Baby Blue Rhinestones to accent the stamped images. 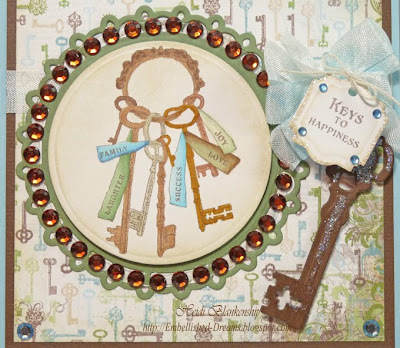 The stamped images are from the Keys to Life stamp set from Crafty Secrets. To started I stamped the image on to Simply Smooth White cardstock using Rich Cocoa Ink. 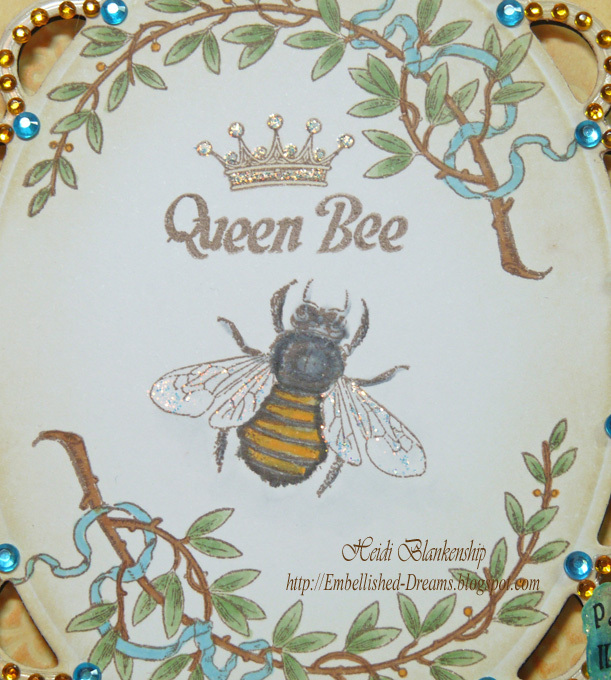 I added the color with Copic markers and then used S4-116 Standard Circles Small die templates from Spellbinders™ to cut/emboss the circle. Then I inked the edges with Antique Linen Distress Ink. I stamped the sentiment from the Keys to Life stamp set and then cut/embossed using S4-346 Labels Twenty-Two and inked the edges with Antique Linen. To create the key I used S4-298 Antiquities. The Nestabling™ I used is Heart Circles Brown Rhinestones. 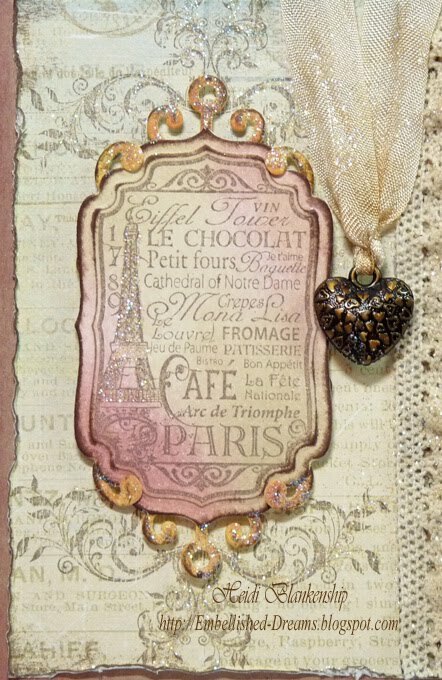 As you can see from the photo I am not using the Heart Circles die cut, I used S4-345 Picot Edge Circles. The Nestabling™ was made to go with Heart Circles but as you can see it also works with other decorative edge circle die cuts. If you don't happen to have the die template to match the Nestabling™ don't be afraid to play around a little, be creative and think outside of the box. You might find a new favorite combination. 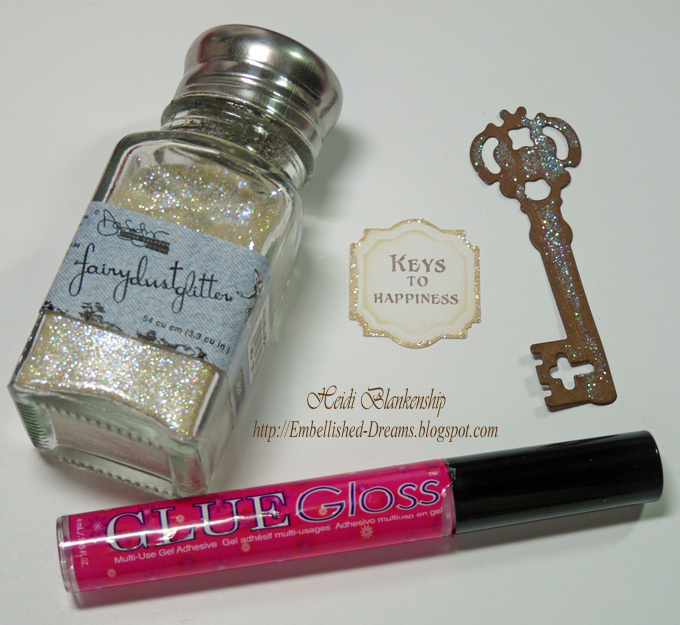 ;-) To add a little sparkle I used Glue Gloss and Pralines & Cream Fairy Dust Glitter to the label and the key. 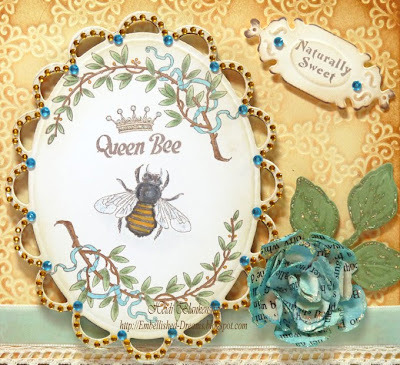 I used 72 Count Baby Blue Rhinestones to accent the label and the corners. Thank you so much for stopping by today!! I hope you have a creative day!! Hello blogging friends! 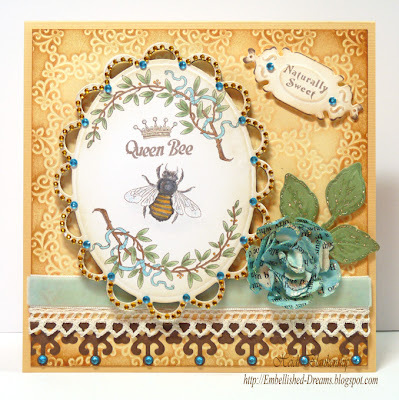 Today, I have a card to share with you using one of the New Crafty Secrets stamp sets, Queen Bee. I started by stamping the images from the Queen Bee stamp set on to an oval die cut. Then I added some color using Copic markers (listed below). To make the die cut I used the Grand Calibur™ and S4-314 Lacey Ovals from Spellbinders™. After I had all of the coloring done I applied adhesive to the die cut and adhered it to Nestaboard™ Lacey Ovals from Want2Scrap™. Then I added the Nestabling™ Lacey Ovals Orange Rhinestones and Baby Bling Turquoise Rhinestones around the oval die cut. 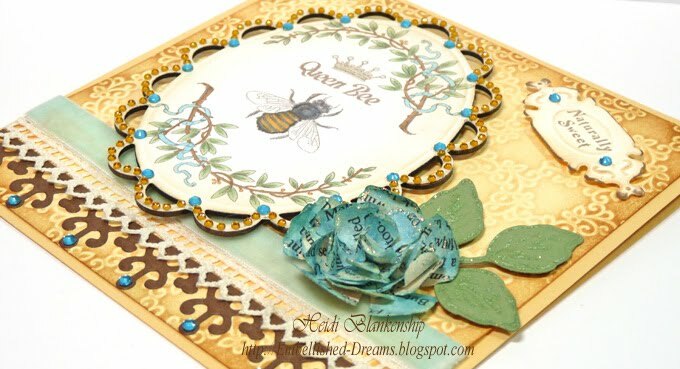 I also made a little tag using a sentiment from Queen Bee stamp set and LF-002 Creative Book Pages Two. 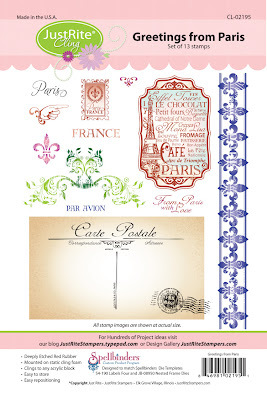 Here is a close up of the stamped images. I added diamond stickles to the crown and wings. 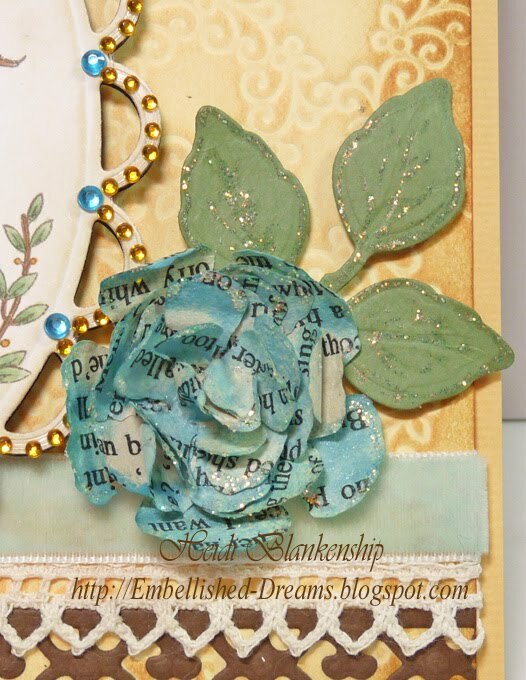 To create the flower and leaves I used S5-050 Rose Creations and S4-328 Foliage. 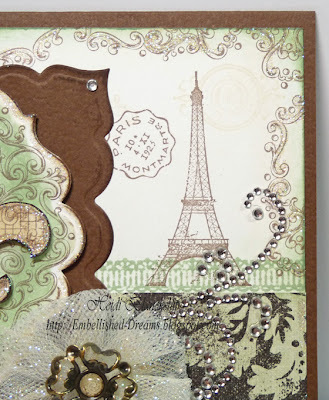 To create the border I used S5-058 Ironwork Accents die template and lace and trim. 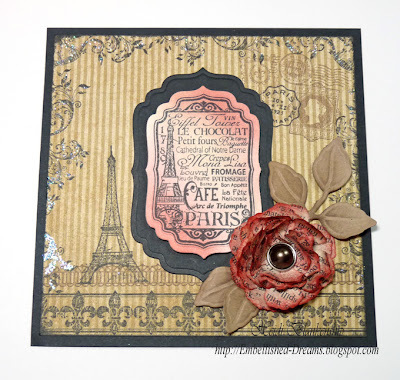 To create the background I used the New Grand Impressabilities GI-004 Fancy Flourish and then made the embossing really pop by adding a couple colors of ink. Want2Scrap™ & Graphic 45 Blog Hop - Day 3! !